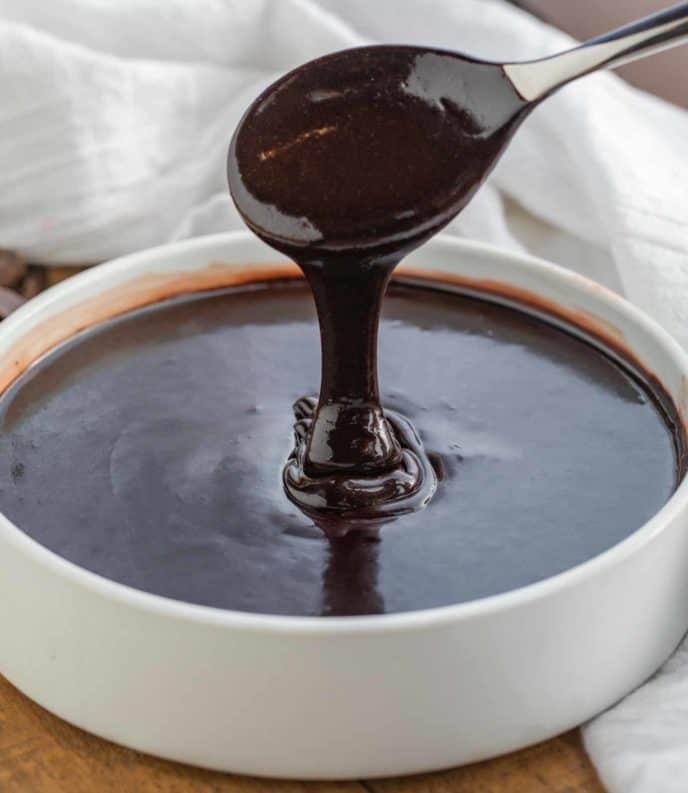 Easy Hot Fudge Sauce is sweet and indulgent, made with cocoa powder, butter, sugar, and heavy cream with vanilla, and ready in only a few minutes! We know that toppings are just as important as the main dessert, which is why we’re sharing our Easy Whipped Cream, Chocolate Ganache, and Chocolate Frosting! 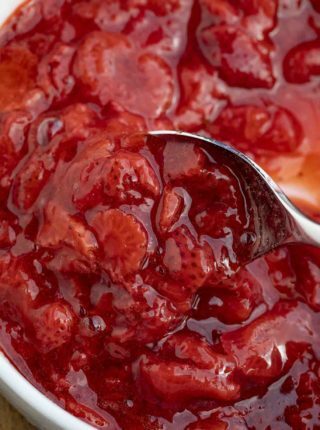 Easy Hot Fudge Sauce is a thick and indulgent dessert topping, and only takes a few minutes to make on the stove. Plus it’s made with only six ingredients that you probably already have in your pantry. This is like a sauce-version of your favorite chocolate fudge, made with cream, sugar, butter, cocoa, and vanilla extract. I am absolutely sure that you’ll never want to go back to the store-bought version again! WHAT IS THE DIFFERENCE BETWEEN HOT FUDGE AND CHOCOLATE SAUCE? The big difference between hot fudge and chocolate sauce is the texture. Hot fudge tends to be thicker and more indulgent, while chocolate sauce is noticeably thinner. 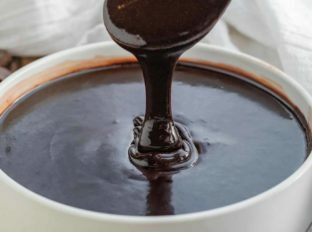 Chocolate sauce also has sugar and water or corn syrup, while hot fudge uses heavier ingredients like cream and butter. You can replace the heavy cream in this recipe with unsweetened condensed milk. If your hot sauce is turning out too thick, add a tablespoon of water at a time until it reaches the right texture. Keep in mind that this recipe will thicken as it cools down. WHY IS MY HOT FUDGE SAUCE GRAINY? Hot fudge sauce can become grainy when it is overcooked and the chocolate is scorched. It can also happen if you’re using semi-sweet chocolate chips instead of cocoa powder in this recipe, which requires tempering before adding. 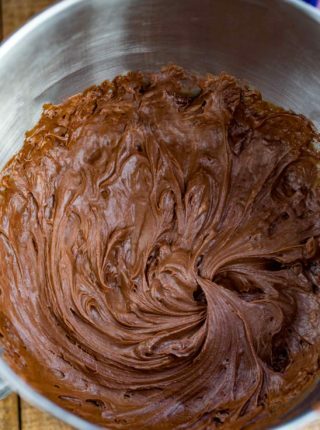 Next time, try mixing in a tablespoon of butter, and cooling the fudge more slowly. I like to store this homemade hot fudge in the refrigerator, because it contains heavy cream. As a general rule, dairy based recipes get stored in the refrigerator. It will keep for up to 2 weeks stored in an airtight container. You can also freeze this hot fudge sauce recipe. 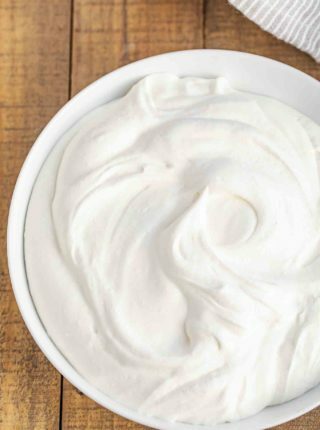 When you’re ready to use it, heat it up in a saucepan over medium-low heat, and add additional heavy cream as needed. Hot fudge sauce may naturally thicken as it cools down. If you’re not getting the texture you want, try raising the cooking temperature and whisking for longer, to evaporate some of the water in the recipe. I like to use unsalted butter for this hot fudge sauce recipe, so I can control the amount of salt in the sauce. It’s really easy to go overboard and salted butter contains varying levels of salt, so this just adds a little bit more control. Use a saucepan that’s made out of a good quality metal. If you don’t have one, use a glass bowl over a pot halfway filled with water, and make the hot fudge in a double boiler for more even heat distribution. Serve this over ice cream, with bananas and strawberries, or drizzle over an ice cream banana split! This recipe takes about a total time of 15 minutes to make, so you can throw it together any time you want! You can use lighter or dark cocoa for this recipe, depending on how sweet you want this recipe to be. Mix with my caramel sauce for a chocolate caramel dessert! Add a teaspoon of cinnamon for more flavor variation in this fudge topping recipe, and serve over chocolate ice cream. Melt white chocolate chips instead of using cocoa powder to make a sauce that tastes like white chocolate fudge! 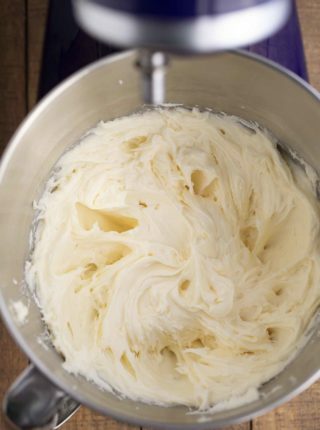 Add the sugar and cocoa powder into a medium pot and start whisking while you pour in the heavy cream until the mixture is smooth then turn the heat onto medium, then add in the butter and salt whisking until melted. Turn the heat off and add in the vanilla whisking well until combined before transferring to a new container to serve from or let cool (it will thicken more as it cools). What do you think of adding a little instant coffee—or a bit of liquid coffee if you prefer? 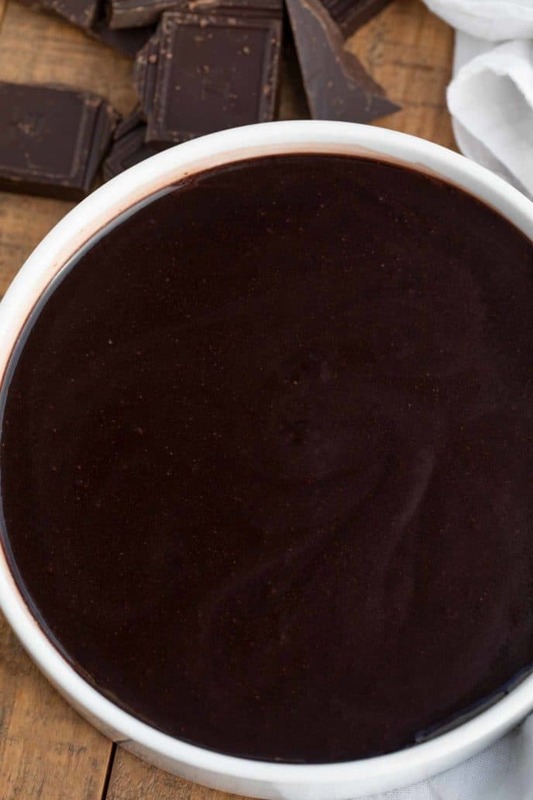 Many chocolate recipes include a little coffee for a richer more complex flavor; I’m wondering if adding this, like adding a little cinnamon, would have a similar effect. I’d add espresso powder to intensify the chocolate flavor. Great idea! You definitely can’t go wrong with hot fudge! This is perfect on so many things! I’ll take the cream and butter! 😉 I love this type of chocolate sauce and your list of tips is fantastic! This sauce looks so decadent and delicious! I could eat it all up for sure. I really shouldn’t be looking at food blogs when I am craving chocolate!!! This hot fudge sauce looks and sounds AMAZING! Haha, I hope you enjoy it! Yum! I kind of want to drizzle this on everything! Sounds like a smart decision!